I have a lofty goal to become like my mother. I want to be organized. She handled ten kids better than I can with just two. She inspires confidence with her steady pace and calm demeanor, whatever life throws at her. I, on the other hand, live on a bit of a roller coaster. I may be focused on the task at hand when suddenly plans have changed and I find myself going in a new direction. Summertime was going to be a relaxing break from school. I had planned regular visits to the city library and taking the kids to the pool a couple times a week as incentives to get a little yard work and housekeeping out of them. Of course, there would be plenty of time for picnics, family outings, and getting together with friends. That was the plan. Then things got out of control. I look around and wonder how I could have been so busy and still have so much undone. I’m surrounded by half-finished projects. The garden is full of weeds, again, after spending all day on it two Saturdays ago! We’ve made four or five visits to the health clinic in the time we should have taken books (that are overdue and one now lost) back to the library. I had a surprise visit to the dentist and several trips to the pharmacy. And to top it all off, the kids have spent the first twelve days of their summer vacation on the couch in front of the t.v. with respiratory infections and strep and all the wrappings. YUCK! So much for positive momentum going into summer! I have to keep thinking THE GLASS IS STILL HALF FULL! But things don’t stay picture-perfect for long. 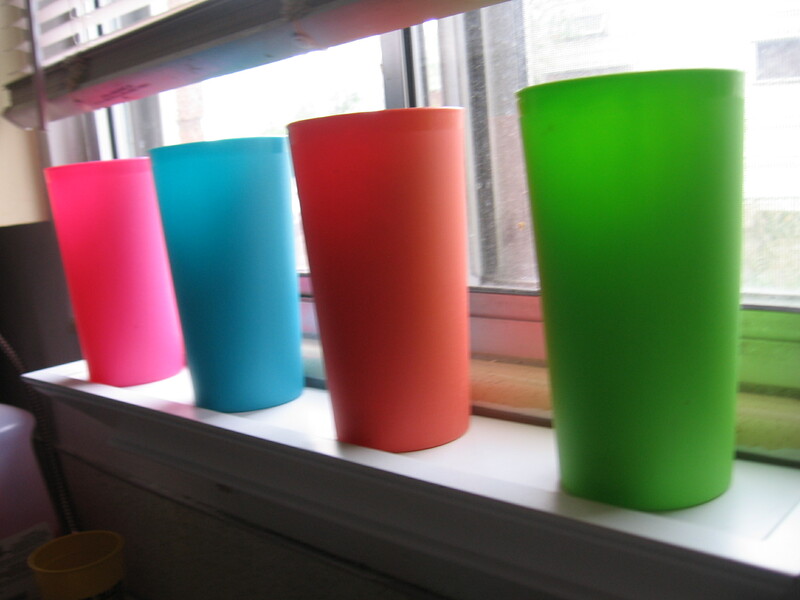 By default, when everyone got sick, all the cups returned to their old chaotic ways, only worse. No one can remember where they left theirs, and certainly won’t drink out of one that might be someone else’s. 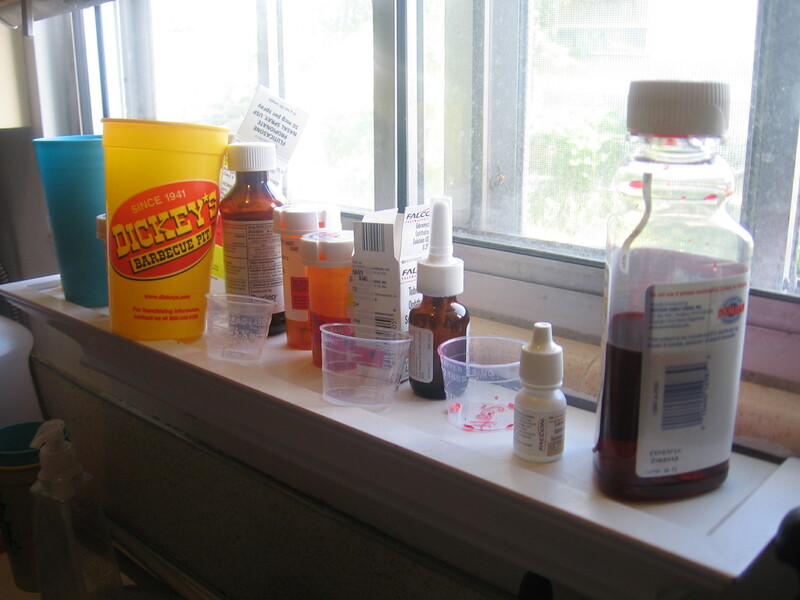 Waiting on “sickies” means I’m finding cups in every room in the house and on every possible surface–everywhere but on the shelf above the kitchen sink. That spot has been taken. I have hope that order will be restored one day soon. Just as order can come from a frustrating water cup situation, we made a pleasant discovery that might not have been possible if we hadn’t all been sick at once. I’ve been reminded that “hope springs eternal” and blessings can come in unusual packages. Taking six prescriptions to the pharmacy at one time wasn’t something I relished, particularly because we’re on the “self-pay” plan. I was afraid to add things up, but I figured it would be in the several-hundred-dollar range. The nurse practitioner at the clinic had mentioned to me that the price club might be a good alternative to the pharmacy we had been going to, so I called the Sam’s Club Pharmacy to compare. They quoted $16 for the medication in question. We had been told to expect it to be $59 (times three of us!) SOLD!!! We were ringing out at the pharmacy to the tune of $150 and actually feeling pretty happy about it, when they asked if we had been told about the premium membership 40% off deal. We walked out of the store a half hour later with an upgraded premium membership (good for the rest of the year) several groceries, and all our remedies for $147! I wish someone had told me sooner! Everyone’s life is full of ups and downs—-it’s all about how you take the ride. A calm demeanor doesn’t mean someone has things easier than everyone else, only that they’ve learned to ride with their hands in the air and trusting the Higher Power. I don’t have to choose between being in total control of my environment or lose control. But I can choose to take charge of my actions when they can improve the situation, and my outlook when my actions can’t change things. I can choose to think that even strep can be Heaven sent.